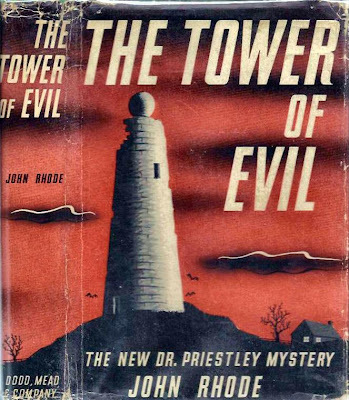 I write about John Rhode's The Bloody Tower (The Tower of Evil in the United States) in my book Masters of the Humdrum Mystery: Cecil John Charles Street, Freeman Wills Crofts, Alfred Walter Stewart and the English Detective Novel (2012). It's one of my favorite detective novels by the author, whose real name was John Street (John Rhode is a pun, you see!). Since my book was published in June, I have come to conclude that the folly which likely inspired the titular tower of The Bloody Tower is Wainhouse Tower, built over 1871 to 1875 at the behest of John Edward Wainhouse, an Yorkshire industrialist. 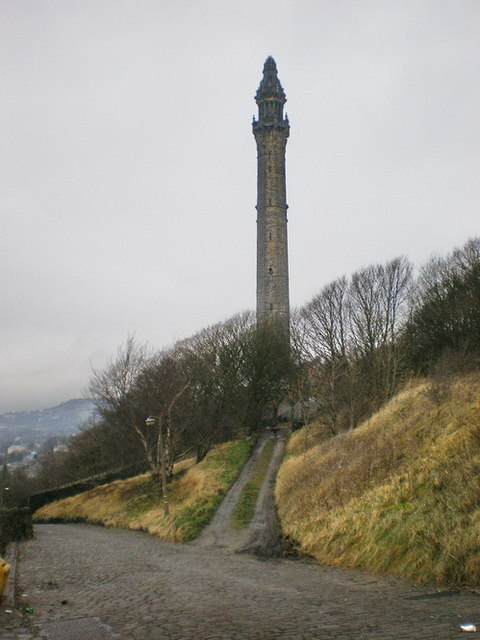 Wainhouse intended the structure to serve as a chimney for his Halifax, Yorkshire dye works. By constructing it high on a hill, Wainhouse hoped to disperse smoke from the town (I can sympathize; there used to be a paper mill in my hometown of Tuscaloosa, Alabama and every time we drove past it the rotten egg smell was overwhelming). Unfortunately, Wainhouse sold the dye works before the great chimney was completed and the new owner refused to take over the half-completed structure. So Wainhouse turned it into a folly, an Italianate observation tower, 253 feet high with 403 steps. 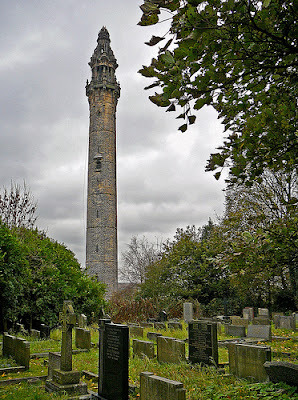 It is sometimes referred to as the Tower of Spite, due to a legend that Wainhouse built it in order to spy on his neighbor Sir Henry Edwards, an opponent of industrialization. The Calderdale website says this story is apocryphal, but it would make a good plot for a detective novel! Street was quite familiar with this part of Yorkshire, as his maternal grandfather's ancestral home was Storthes Hall Mansion in Kirkburton, only about a dozen miles away from Halifax. The tower in John Rhode's The Bloody Tower is described as being "not unlike a truncated factory chimney with a ball balanced on top of it." The American dust jacket design captures this image rather well, I think. Certainly Rhode's fictional tower variant is much less attractive than Wainhouse' actual one, but it does indeed look like a factory chimney! Nevertheless, the tower in Rhode's novel was not built by an industrialist, spiteful or otherwise. The Bloody Tower is a tale of agrarian squalor, being John Rhode's contribution to the "rural gloom" genre of English novels associated at this time with the works of Mary Webb and so memorably satirized in Stella Gibbons' Cold Comfort Farm (1932). "Pretty dreary stuff," sniffed Jacques Barzun in his and Wendell Hertig Taylor's Catalogue of Crime, but this is rather the point! In The Bloody Tower, Simon and Caleb Glapthorne, father and son, live in squalor at their decaying Georgian country home, Farningcote Priory, attended by two slatternly servants. Looming over them all is the folly built by their eccentric eighteenth-century ancestor, Thaddeus Glapthorne, founder of the now almost entirely diminished family fortune. Caleb, who is found at the beginning of the novel with half his face blown away by a rifle shot, spent his evenings at home guzzling gin with the dipsomaniac cook, when not pursuing the neighboring farmer's daughter. At first it seems that the shot that killed Caleb was self-inflicted, but then it comes to appear that some other person may have contrived the "accident." Did the neighboring farmer do the deed, or was it someone else, like Caleb's younger brother Benjamin, disgraced in his father Simon's eyes because he abandoned the collapsing Glapthorne estate to become a marine engineer (Simon considered it "beneath the dignity of a Glapthorne to wipe his hands on a piece of cotton waste")? Street neatly ties in the death of Caleb with the Glapthorne family prophecy inscribed on the tower, that so long as the tower stands, "So long shall Glapthorne dwell in Farningcote." 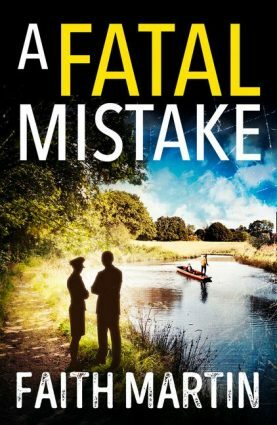 Rhode's police detective Jimmy Waghorn eventually solves the mystery (with considerable help from his detection mentor Dr. Priestley), but not before more deaths occur, one of which is surely something rather unique within the history of the genre. While The Bloody Tower is nowhere near as bleak and depressing as P. D. James' The Black Tower (see here), it is not exactly a cozy story. Street is uncompromising in portraying the decay and filth of Farningcote Priory and its denizens, which is of a piece with the generally skeptical view that Street takes of the English gentry in his John Rhode books in the 1930s. Like James, Street also refuses to prettify death by violence. The Bloody Tower is aptly named, for the book is sometimes bloody. "The right side of his face was completely blown away, leaving nothing but naked and shattered bone. His dark hair was matted with blood and his left eye, apparently uninjured, stared glassily toward the cobweb-hung rafters." "Coo, wasn't there a muck of blood too," exclaims with relish the lad who found Caleb's body. "I never seen the like since Charlie...took me into the yard to see a pig stuck!" 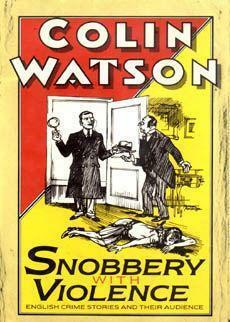 In his book Snobbery with Violence, Colin Watson writes that violence in Golden Age detective fiction is "conformist, limited, unreal....A bullet hole almost invariably is neat (as a putt in golf, perhaps)....Blood is generally a 'spreading stain' or a 'pool,' both fastidious expressions that convey nothing of the terrible glistening mess that is made of human butchery." Well, in the case of the death of Caleb Glapthorne, anyway, the massive head wound made by the skull shattering, brain spattering impact of the bullet can hardly be called "neat"! Colin Watson gets the violence and the snobbery part wrong too, in relation to The Bloody Tower. Needless to say, since this is a John Rhode novel, the plot is scrupulously fair. You may well spot the culprit, although the exact nature of the plot and the splendid murder methods should be harder to divine. But then you could say the same thing in this respect about P. D. James' book too! It's an excellent novel. Thank you for reminding me to re-read it. UNO, glad you liked too. One of the cases where I part company with my fellow traveler Jacques Barzun on Rhode. Terrific post. Unfortunately, the Canadian library system has failed me here-- this book wasn't available for ILL under either of its titles! Looks like it's off to bookfinder! Thanks, Patrick. This is one I would have liked to have seen reprinted! It would have been fun to get two dozen or so of his books reissued. There are publishers who want to do it, just not Street's literary agency or heirs, apparently. Movie Review: SPLIT SECOND (1953).